On a recent visit to Cardiff’s Castle Quarter, I strolled along The Animal Wall, an impressive series of sculptures depicting fauna from across the world. These include an anteater, a seal and a hyena. 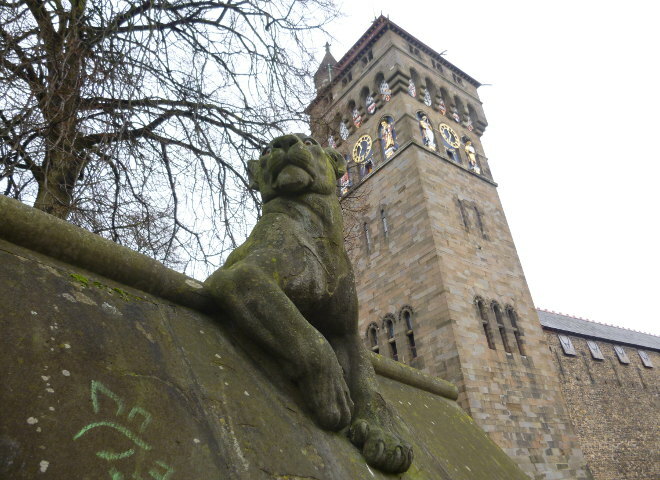 My favourite is the stately lioness, pictured above with the Castle Clock Tower. Designed by William Burges, the first nine were sculpted by Thomas Nicholls in 1890, with six more added by Alexander Carrick in 1931. I love the idea of making one or more of these statues the site of a clandestine rendezvous – “meet me beneath the pelican at 9.15…” Or could the animals themselves have a secret other life?